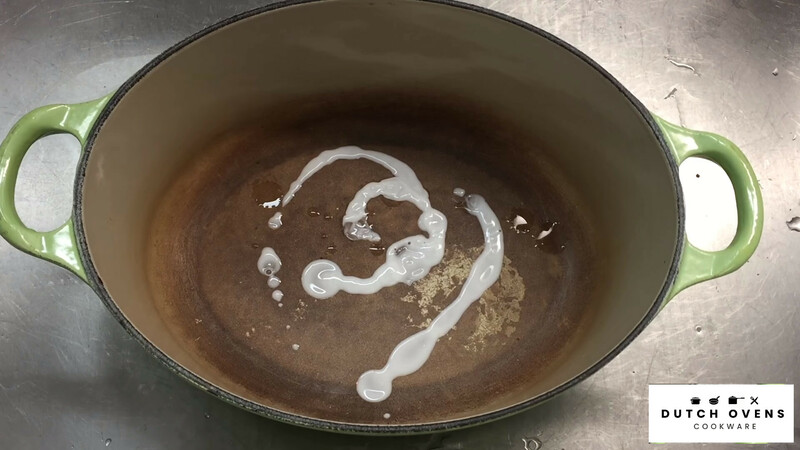 How to clean discolored enamel cookware? How to clean outside of enameled cast iron? How to clean a dutch oven with burnt mark? 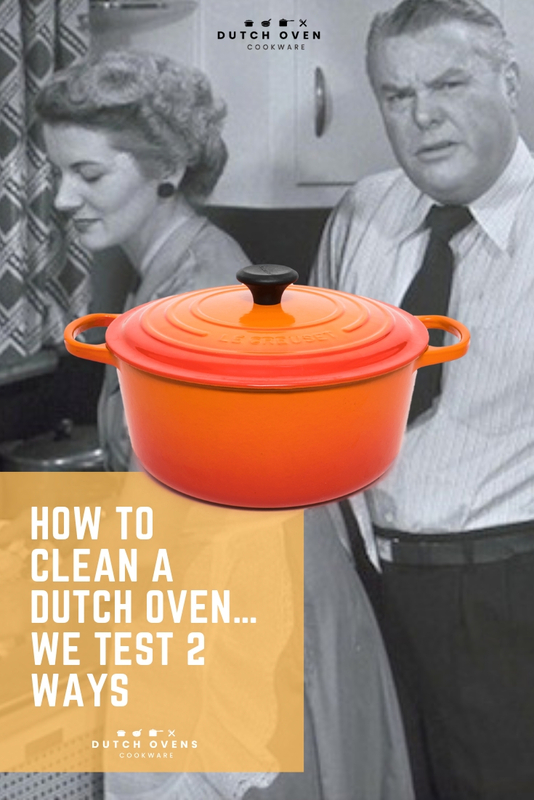 Can you wash a dutch oven in the dishwasher? 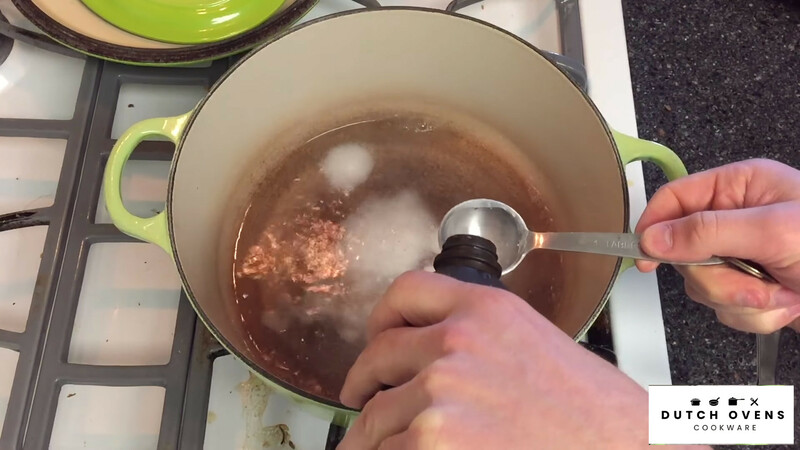 Can you use soap to clean a dutch oven? Dutch ovens are the most wonderful piece of equipment which I am really passionate about. If you’ve read any of my articles, this fact should shine through. However, I am totally realistic about what can happen to Dutch ovens if they are not cleaned properly regularly. 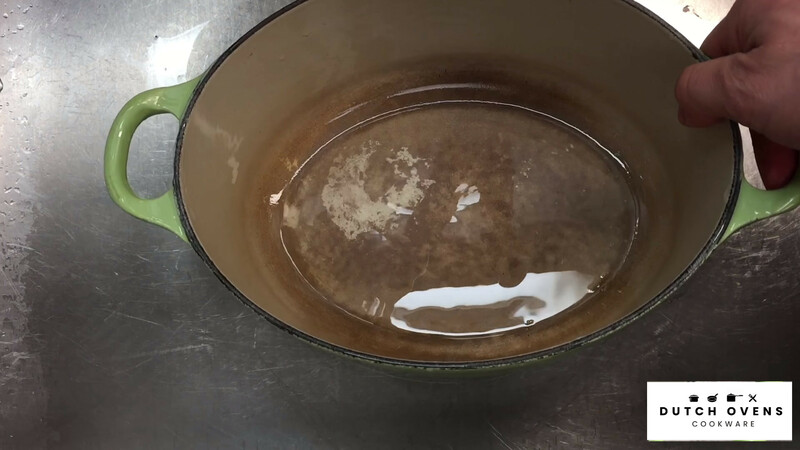 There are some people that prefer to keep the stains in their pans as it reflects the fact that it has been used. I understand this because they are there to be used. On the other hand, there are some people that want their Dutch ovens to look as clean as they day they were bought. 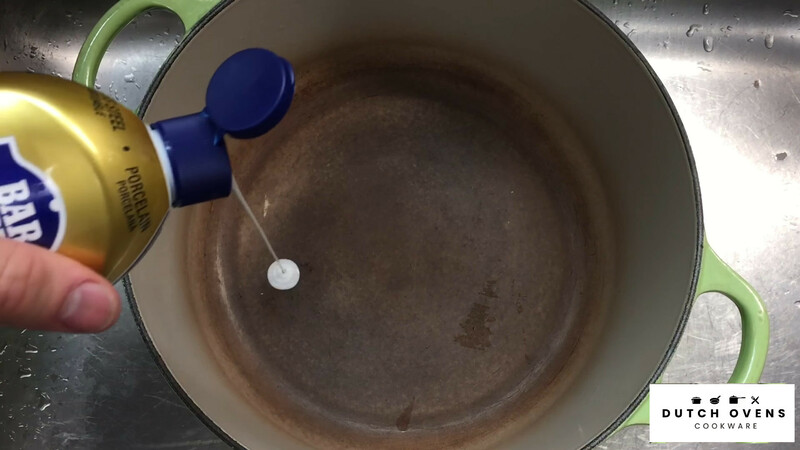 If you have a Dutch oven that is lightly stained, then the following methods I show you will deliver excellent results. They will remove stains and get your Dutch oven looking like new. 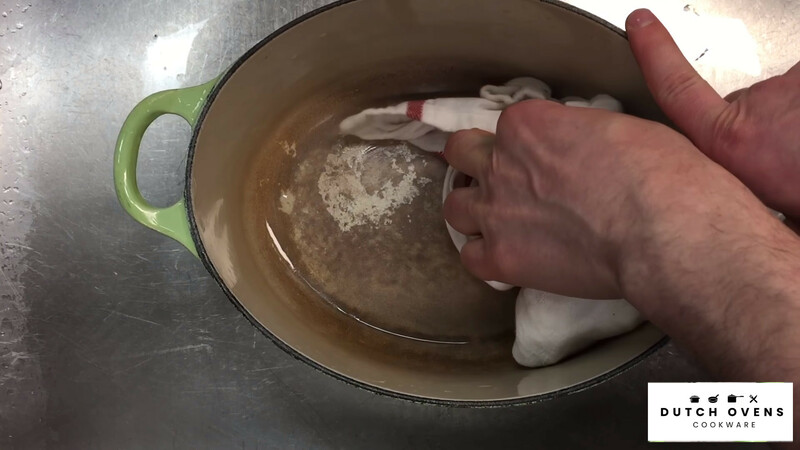 However, if you let your Dutch oven get stained over a period of time without going through the cleaning process, there is nothing you can do to get it looking new again…regardless of the hundreds of articles you may read telling you otherwise. At best, you will be able to lighten the stains but if you are hoping for them to be removed, you are about to be disappointed. If there is any consolation, the Dutch oven will work as it should regardless of the stains inside it. I appreciate that this may disappoint you but there is little you can do. If you have really dark looking stains in your oven, then you should go through this process as it will make them look lighter and ultimately, cleaner. 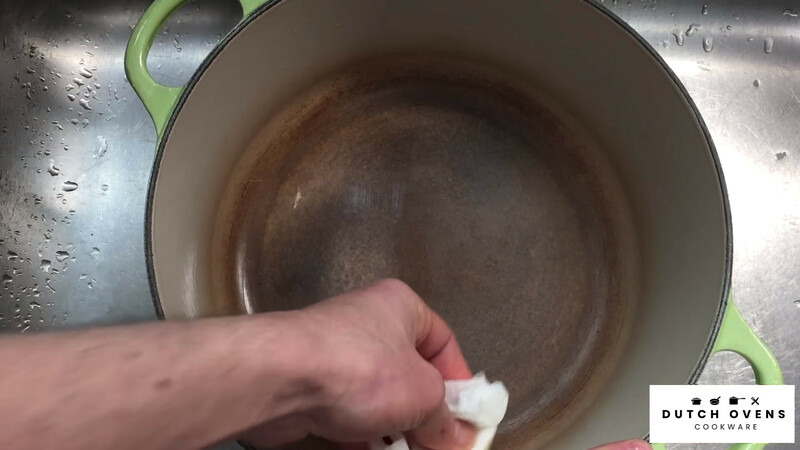 This is the process of how to clean a Dutch oven. I am cleaning the enamel indoor variety rather than cast iron outdoor Dutch ovens. I will be showing you the results of various cleaners. First, I will test an old favorite, Bar Keepers friend. 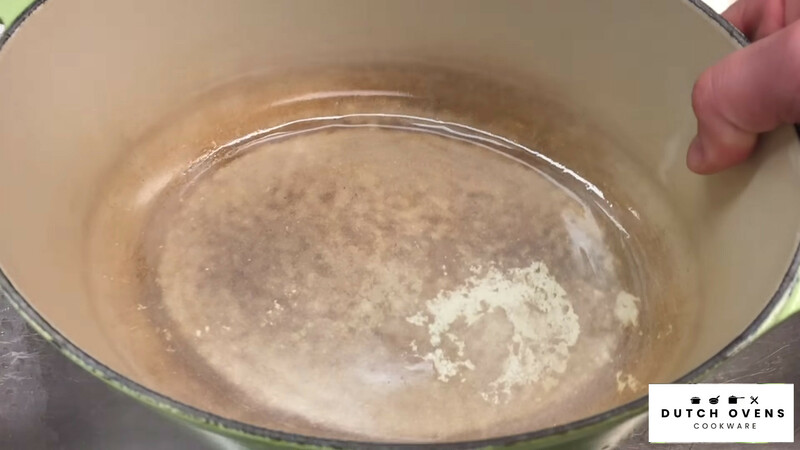 Following which, I will show you the process for using Baking Soda and Hydrogen Peroxide. Both these methods are safe to use with your enamel, but please follow the instructions. Enamel cooking surfaces are incredible but they can be incredibly difficult to clean. Even if you scrub it really well, the interior of the Dutch ovens gets stained over time, even if you clean them really well. This is not your fault…it just happens this way. There is no really good 100% way to get the stains out. I find that using Bar Keepers Friend can be effective but it is very labor intensive. Here you can see the effect of one minute of scrubbing…very little difference as you will agree. 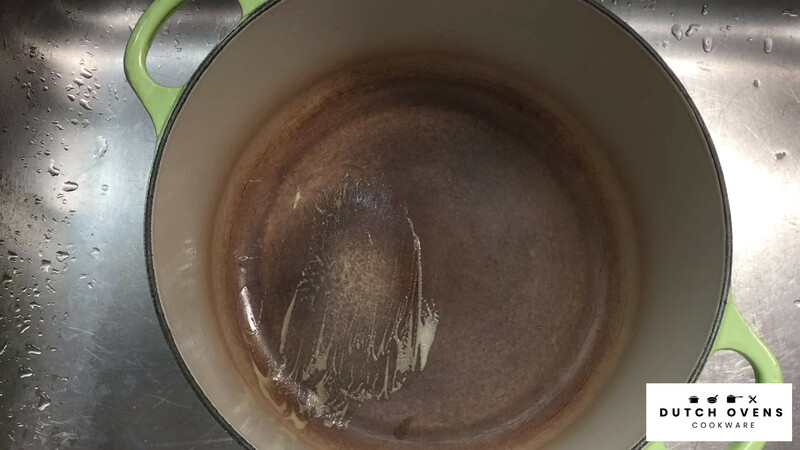 Bar Keepers Friend is good on a use by use basis but on heavily stained Dutch ovens, the results are minimal. As maintenance it is effective but this test is on a heavily stained Dutch oven with multiple uses without stain cleaning. One of the popular recommendations of cleaning Le Creuset Dutch ovens is mixing baking soda with hydrogen peroxide. The chemical reaction created with the two combined with boiling is a safe and effective way of lifting stains from the inside. However, it is not a super powerful way in terms of results so have your expectations in check. The good news is that it wont harm the Dutch ovens enamel coating and it will lighten up the color of the inside. In order to ensure that there was a consistency in my tests, I cleaned two Dutch ovens…a round and oval version. The first part of the test was to use Bar Keepers Friend. Literally poring some in and scrubbing it with a scouring pan. It did make some difference but it was a lot of work. I move on to the next part of the test. 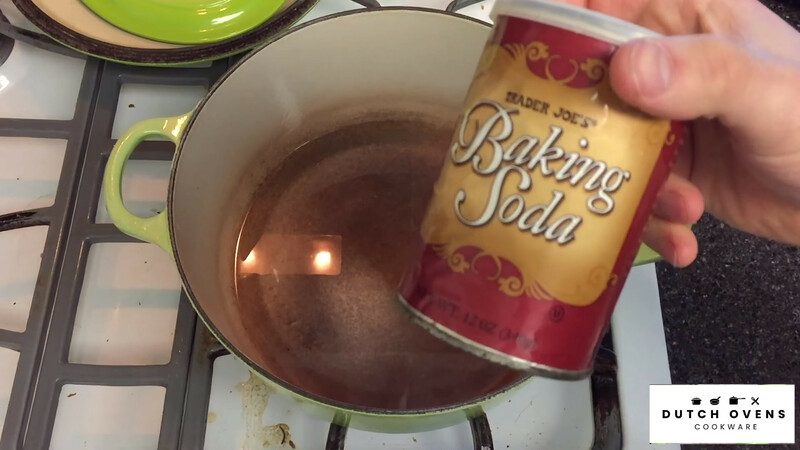 I add a couple of table spoons of the baking soda to a cup of simmering water. 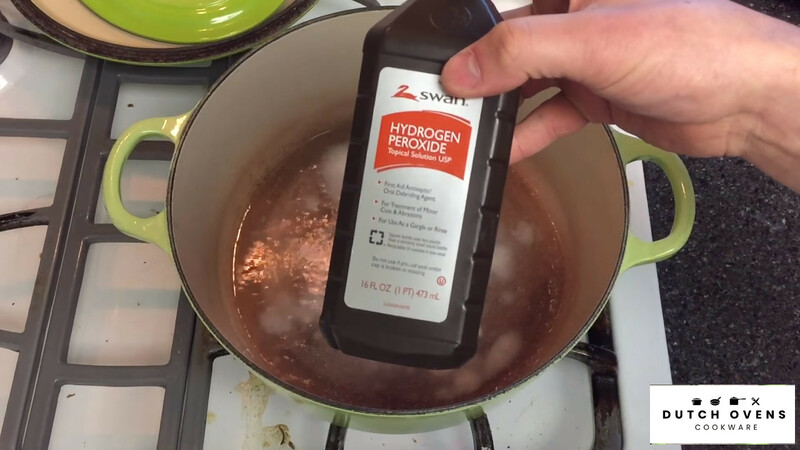 I then add a couple of table spoons of the hydrogen peroxide, mixing it into the Dutch oven. I then leave it to simmer. Over time you will see some of the stains pull up. The problem is that the stains usually pull up in a random way, generally where the oven is hottest. It isn’t particularly that effective either on a heavily stained pan. I then try to scour the bottom of the Dutch oven to see if it loosens up any of the stains…which has very little effect. The results of my tests were OK when you consider the state of the staining on the Dutch oven. I can be happy that they have lightened and look a lot cleaner than they did initially. I repeated the steps found on the first test to see whether it was the staining that was the issue or the cleaning method. Remember, these are the two most advocated cleaning methods I found doing my research. The staining on this Dutch oven was similar to the first with a slightly darker stain, probably caused by some acidic food being cooked. First, I attempted to clean it with Bar Keepers Friend. It did a decent job of lightening it but was unable to remove the acidic stain. This was the same result as the first test. On lighter stains and on Dutch ovens cleaned quite frequently, Bar Keepers Friend will do a good job. 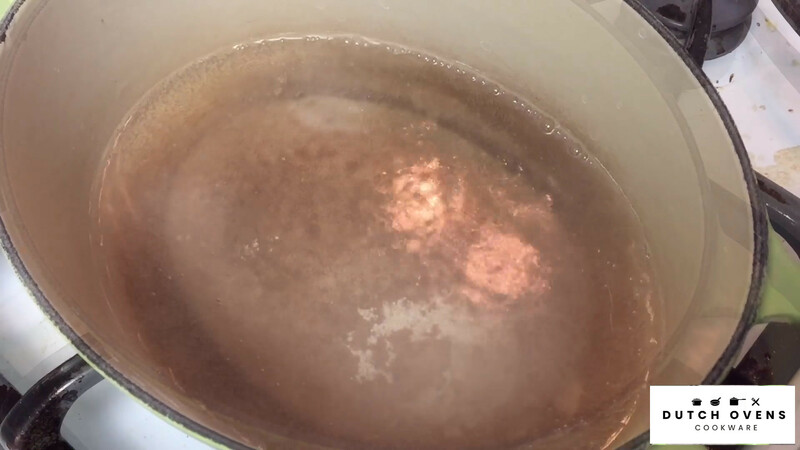 As you can see from the pictures below, this is a heavily stained Dutch oven that has NOT been through this process despite being used numerous times. I then repeated the Baking soda and Hydrogen peroxide test using a couple of tablespoons of each…in a cup of water that was simmering. After mixing, I left that for 10 minutes to see if it lifted anything off the base. The effect was similar, the color of the stain lightened but the stain was still visible. The acid mark was pretty much unchanged. I also gave it a scrub to see if anything further could be removed…it didn’t. It lightened the staining but that was about it. I’ve read plenty of articles online about how to get your Dutch ovens looking pristine…even after some heavy staining. The reality is different. I ran the two tests that are most popular and both of them were found to have limitations. At best you can describe them both of lightening the stains but not removing them. This is contrary to what I often read is promised. The only way this could be true is if your food produced very little staining in the first place or that you ran through this process every time you cooked something in your Dutch oven. Having said that, the stains were much lighter yet visible. It did make my Dutch ovens look ‘better’ so there is some benefit of running through these methods. As for which method I would choose…Bar Keepers friend or Baking soda/Hydrogen Peroxide…it is a case of either or I’m afraid. 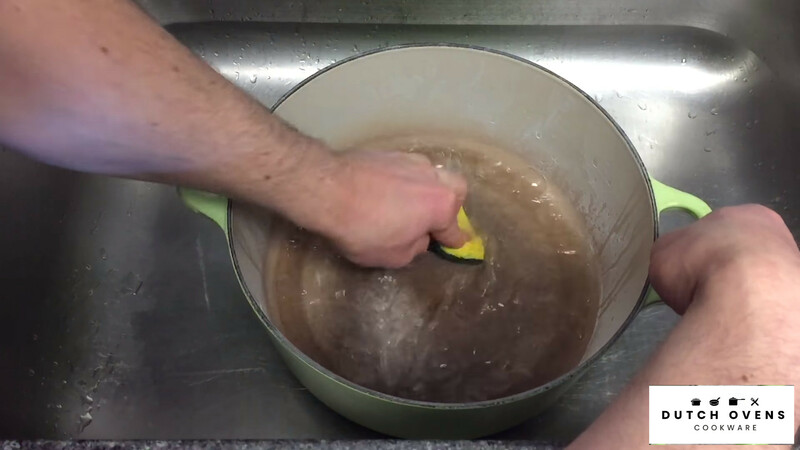 Bar Keepers Friend is simpler in that you pour some on and scrub while the other method involves simmering water and a chemical reaction that doesn’t smell great. The end result was similar, both lightened the heavy staining. On the first test, I am using Bar Keepers Friends with a scouring sponge. As you can see, the Dutch oven is heavily stained. I already know this is going to take some work. I’m not overly confident but i live in hope! After one minute of scrubbing with the scourer, you can see that it has removed some of the staining but not too much. I decide that it is way too much effort for not a lot of result. Again, i know it is heavily stained and actually on lighter staining, Bar Keepers Friend would work very well. I wipe it clean and get ready for the next part of the test. 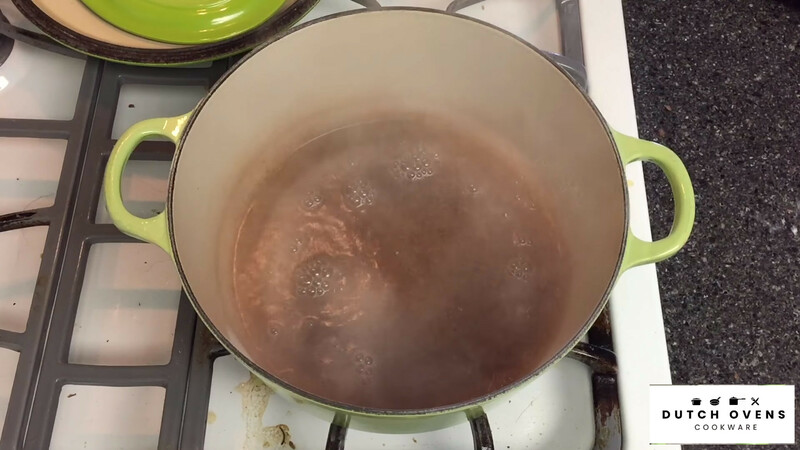 In the second part of the test, i am warming some water to a simmer on the stove. I will be using two tablespoons of Baking soda. I then add two tablespoons of Hydrogen Peroxide to the Baking soda. I then let it simmer for 5 minutes. I will occasionally scrape the bottom with a silicone spatula in the hope that it helps remove some of the staining. Once i have removed the Dutch oven from the stove, i then start scrubbing the bottom of the pan with the scouring pan. You can see with the color of the water that some of the staining has been removed. However, after some serious elbow grease, the results aren’t as i had hoped. The staining is still there albeit lighter than the original starting position. In order to make sure it wasn’t the Dutch oven that is the problem, i conduct the test again using a smaller oval Dutch oven. The outcome of the oval Dutch oven was better than the first Dutch oven. The stains were significantly lightened when compared to the starting position. However, i very much doubt there is a solution out there to remove this staining. I could repeat the exercise but i think it will make minimal difference. I have heard of another solution of using bleach but i don’t think that is a risk i am prepared to make. I prefer the stain in the oven rather than the risks associated with bleach. I can live with this ‘lived in’ look. If you are looking at the inside of an enamel Dutch oven, follow the process above. As I explained above, there is a limit to what you can achieve. If it is lightly discolored, then potentially you can restore it to almost new condition. If it is heavily discolored, then you should temper your expectations as it will not clean as you expect. The best you can hope for is to lighten the stains so that they do not look as prominent nor ugly. If your Dutch oven is discolored on the outside, there is pretty much nothing you can do if the actual paintwork is stained. 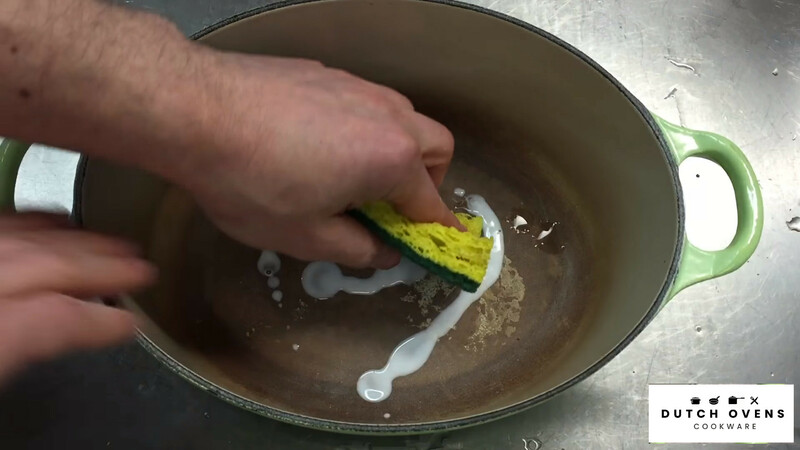 If it is a burn mark from the stove, you can scrub it using Bar Keepers Friend in the hope it may help remove it. However, do so at your own risk. Please remember that if you damage the paintwork, it will stay that way. You may also end up dulling the paintwork if you do this. Obviously, it is the benefit of hindsight but always be conscious that the stove ring size is appropriate to the size of the Dutch oven. This is definitely avoidable damage by being aware of it. 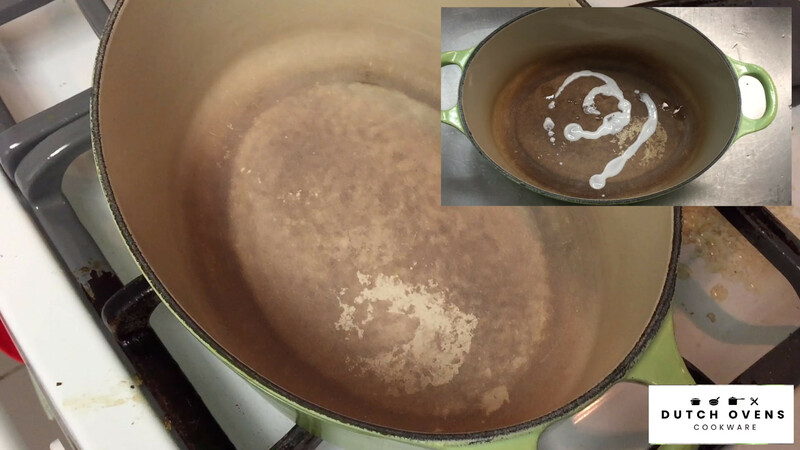 You should always take care when cleaning to outside of a enamel Dutch oven, since this is the visual that people see. If you can, just use water to clean with a minimal amount of detergent. 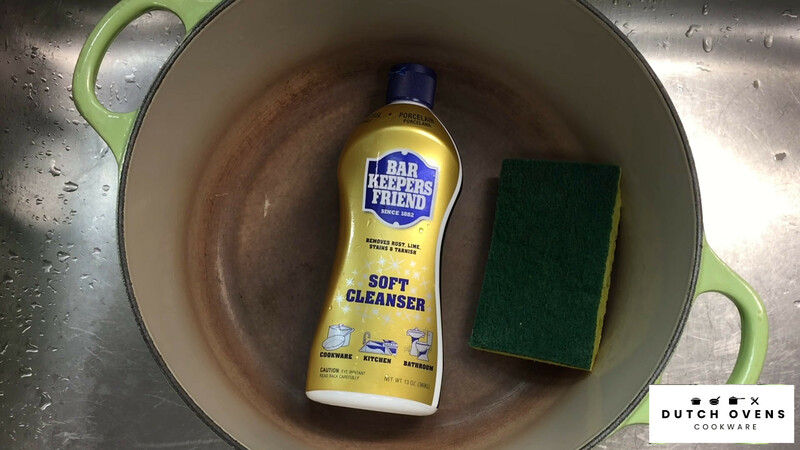 If it is very dirty that needs a deeper clean, try Bar Keepers Friend. It is always advised to hand wash only. If it is a burnt mark on the inside, then I would advise you to follow the steps listed above. 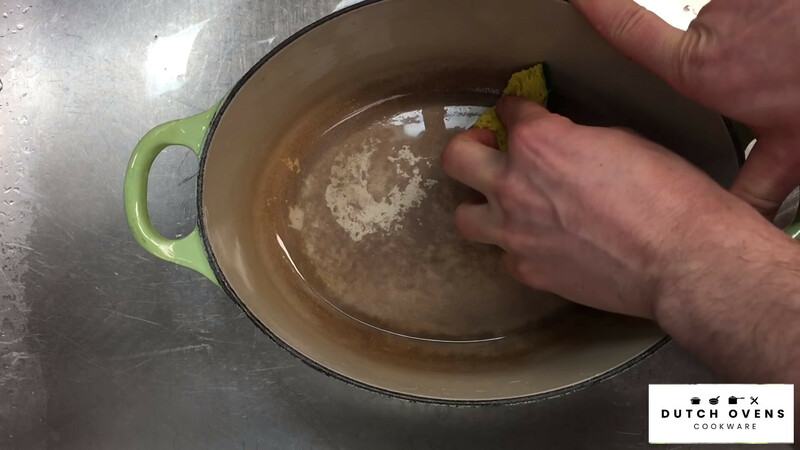 You can use either method…Bar Keepers Friend or the Baking Soda and Hydrogen Peroxide method. If it is an external burn mark, you are limited to what you can do as there is a danger of damaging the patina and paintwork. Whatever you do, start slowly and lightly when scrubbing it. If you see the paintwork getting damaged, stop. It is better to have a used looking Dutch oven with a burn mark than a Dutch oven where the paintwork is peeling. Yes, you can wash your Dutch oven in the dishwasher if you really don’t care about it. Every manufacturer will tell you not too…as do I. The reason is simple, it will remove the shine and patina from your Dutch oven. The paint will dull and the color will lose its luster. 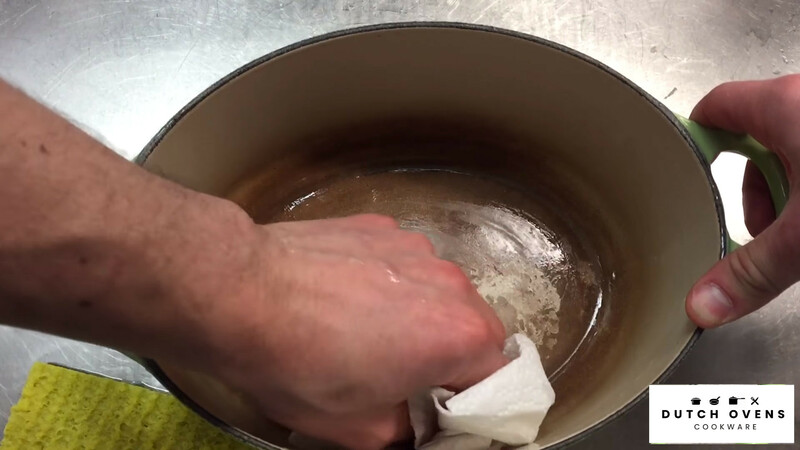 In most cases, warm water and a small amount of detergent is enough to clean your Dutch oven. It should not need to be put through a dishwasher cycle. Yes, on an enamel Dutch oven you can without any issue. In fact, it is recommended that you use soap with warm water to clean it. 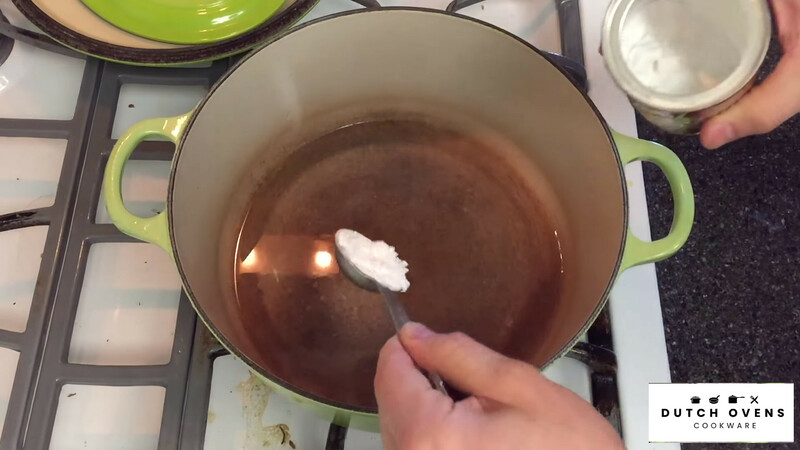 If you have a plain cast iron Dutch oven, then you should NOT use soap as it removes the seasoning. If you do use soap, you will have to season the Dutch oven again. have you tried using bleach to remove the stains ? 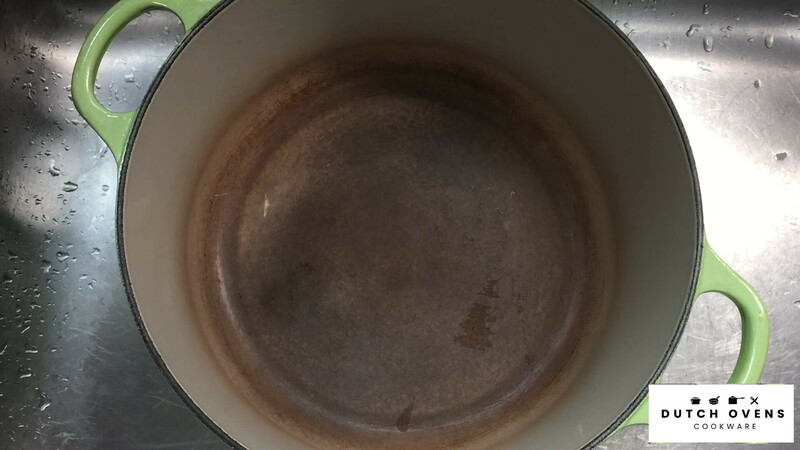 I bought a heavily carbonized and stained dutch oven from Good Will, used the baking soda method and a scrub pad, and after all the burned on food/carbon was removed, i soaked the stain with a 50/50 bleach / water solution over night. It looks great now. Yes i have heard and spoken to people about this. I have never tried it though as i’m uncomfortable about using bleach in my cookware. If it works for you, that’s great.